Last weekend Dan and I spent a lovely night with our friends Sophia and Adam and got well and truly in to the festive spirit! We donned our Boohoo Christmas jumpers, ate some amazing food (thank you Sophia!) and chatted the night away about all things Christmas. 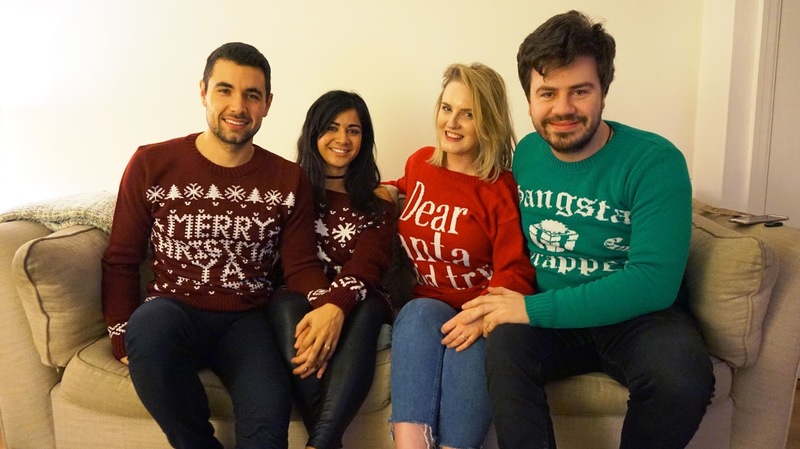 We even watched the Royle Family Christmas Special (and X Factor, obvs) and after a lot of attempts we managed to get some photos of the four of us in our festive knits! There’s a huge range of jumpers to choose from from the Christmas shop over at Boohoo, but I think we picked some pretty darn good ones if I do say so myself! 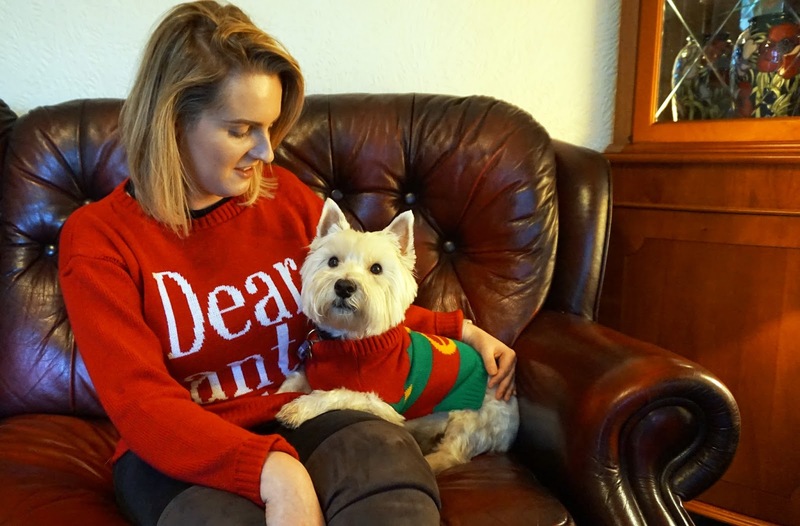 Even Toby got in on the Christmas jumper fun as they even stock a dog’s range! One thing we did get chatting about was our Christmas traditions. Sophia and I are like excitable little kids at Christmas time, so we thought we would share our traditions with you too! “We put the tree up the weekend after my birthday as obviously I have to have the full attention!! Christmas comes after my birthday celebrations in our house – we put up the tree and decorate the house while watching Elf and eating Christmas snacks with the log burner going! We always go to my mum & dad’s house on Christmas day as my littlest brother is only 10 and we love that it’s still magical, the whole family is there and we eat and drink until we can’t move. We then move into the games room and play whatever Freddie got for Christmas while struggling with the meat sweats. My Christmas traditions don’t differ too much from Sophia’s (anyone who knows us will know that we’re practically the same), except things start a little earlier in our house! Our tree always has to go up on December the 1st (I’m literally counting down the days) and we also watch Elf whilst hanging on as many decorations as possible without it toppling over! On Christmas morning I usually wake up at around 5am out of sheer excitement (sorry Dan). I try and go back to sleep but I eventually give up and force Dan up to open the stockings we make each other. We then have a lie in, before heading downstairs to open our gifts together at home, then we spend the morning getting dolled up for Christmas dinner! We tend to alternate between my mum’s and sister’s houses each year, so we head out for a delicious meal before crashing out in the living room with games, drinks and a big box of chocolates! Which are your favourite pieces from the Boohoo Christmas shop? Tell me all of your Christmas traditions too! I’d love to hear how you and your friends and family get in to the festive spirit! "CHRISTMAS GIFTS UNDER £10 AT HOMESENSE"